NSDTC's next training session begins April 23, 2019 at The Barking Lot, 495 Lake Cook Rd, Deerfield, IL. Get more information here! NSDTC's members have fun and excel in many performance and breed conformation events with their dogs! 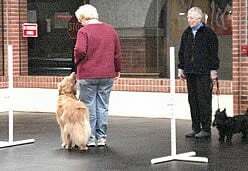 NSDTC is the oldest AKC member obedience training club in the United States. North Shore Dog Training Club's 79th All-Breed Obedience Trial and 14th Rally Trial will be held Sunday, June 16, 2019 at the WAG Training Center, 2807 N US Highway 12, Spring Grove, IL 60081-7808. The combined Premium List for NSDTC and the Golden Retriever Club of Illinois's trials (also at WAG on June 15) is here: Premium List link. Whatever your interest, we've got a class for you and your dog! Beginner / Puppy - learn the basics! Rally Obedience - put those basics to work; and more! A series of stations with instructions to follow. Novice Obedience - Ready for the obedience competition ring? You will be with help from our volunteer instructors! Advanced - If you and your dog have substantially achieved the AKC Companion Dog (CD) title, you're ready to take on higher challenges! Join us for fun events! NSDTC hosts an Obedience and Rally Trial every year. Lots of work, but even more fun! Our annual Dancing with Dogs event is a blast for all who participate - and observe! The picnic and holiday party are more fun events when our members and class participants get together. Info and Pictures!Info and Pictures! Shop the NSDTC logo store in Cafe Press for apparel and more!